Until the year of 1990, it was called a "undisputable fact" that 4 million people had been massmurdered in Auschwitz-Birkenau. It had even been "proved" in the Nuremberg-trials. The revisionists have since long ago objected to the absurdity of this figure, and forwarded documentation that would bring the Auschwitz death-toll down to around 150 000. As a result of the Revisionist onslaught the Auschwitz-museum suddenly, in 1990, ordered the dismantling of the 19 metal plates of the monument where the figure "4 million" was inscribed in 19 different languages. Suddenly the "right" figure according to the museum was 1,5 million, i.e. the figure was revised downwards by 2,5 million! In 1994, the french pharmacist and "holocaust"-adherent Jean-Claude Pressac claimed an even lower figure than the Auschwitz-museum; his latest stand is that 630 000-710 000 people died at Auschwitz, among whom 470 000-550 000 were Jews. In spite of all these revisions, which steadily climb down, closer to the correct, non-propagandistic death-toll, there has never been any official reduction of the total number of 6 million "exterminated" Jews. The desinfection-gas chambers in Auschwitz-Birkenau, as they looked like during the war. Please compare the design with that of the american execution gas chamber. Desinfection gas chambers were used in the concentration camps for the desinfection of clothing using Zyklon-B, an HCN-based pesticide, claimed by "holocaust"-propagandists to have been used to exterminate "millions of Jews" during WW II. This is the door to the "gas chamber" shown to touritsts visisting Auschwitz today. As you can see, this is an ordinary wooden door, of a flimsy design. The door is also provided with a thin glass window, which easily can be shattered. During a hypothetic gassing this obsolete wooden door would leak enormous amonts of the poisonous and flamable Zyklon-B gas, which also is explosive in certain concentrations. Inside the gas chamber unsealed drains can be found, which are interconnected to the drains of the camp. This leaking of HCN would lead to an even worse contamination of the camp area. Please compare this door from the Auschwitz "gas chamber" with the design of the doors of the american execution gas chamber and the desinfection gas chambers in the two other photos, as shown above. 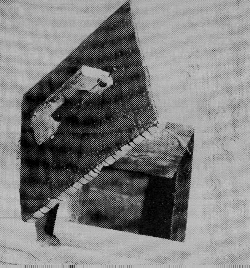 This is one of the roof hatches through which Zyklon-B is claimed to have been thrown down on the waiting prisoners. Please note the shoddy wooden construction of the roof hatch not meating the slightest demands on air-tightness. If you examine the hatch closely, it will be noticed that the hatch is of a recent design, compared to the rest of the buliding. Recently the Auschwitz museum has been forced to admit that the roof hatches on the "gas chamber" are so called "after-constructions", meaning that they were created after the war and the camps liberation. This diagram is based on the official statistics on the numbers of deaths in the concentration camp at Dachau, Germany. As can be see, there is one epidemy of typhus around the winter of 1940-1941, and another one during the winter of 1942-1943. Notice that a major part of the deaths occurred during the final phase of the war, when the food was running short in the camp after the collapse of the German communication system, due to Allied bombings. At the same time, the Germans had evacuated the camps in the east, causing an enormous overpopulation of the few remaining camps in the west. Today it is acknowledged that Dachau was never an "extermination" camp, although the infamous Nuremberg-trials used an alleged "gas chamber" in Dachau, later admitted as a fake, as "proof of the holocaust". What makes this diagram so interesting is how well it illustrates the absurdity of the exterminationists claim that there was a Führer order to kill the Jews, and then another one issued afterwards to halt the massmurder. The first order is said to have been issued around summer 1941, where the diagram shows a drastic lowering of the death rates. The order to stop the killings it is said to have been issued in November 1943, but instead, the death rates instantly increase! In summary this shows how unfounded the claims of the "holocaust"-propagandists are, and teaches one to be more observant and sceptic to what is generally said on the issue of "extermination". In the jewish propgandistic version of the history of Auschwitz,the camp is always portrayed as a pure death camp where the prisoners were gassed to death, tortured, subjected to the most demonic of cruelties, and arbitrary killed on a daily basis. The reality was diffent. Adjacent to the alleged "gas chamber" in Auschwitz-Birkenau, there was the football field of the inmates, giving them a full insight in the alleged "secret". Along with the football field, the prisoners had access to a theater, a swimmingpool and a brothel, a fact acknowledged by the direction of the museum at Auschwitz today. This does not obscure the fact that life in the camp was very hard, mainly due to the hygienic conditions and the typhus epidemies, killing thousands of prisoners, and SS-personnel as well. At the end of the war the lack of food also took an increasing toll. This key map shows all the major camps used by the nazis where hundreds of thousands of people were interned during WW II. In the east, the Polish nazi camps, like Auschwitz-Birkenau, Treblinka and Majdanek, can be seen. The Polish nazi camps are even today accused of being the sites of the gassing of millions of people. In the west, in Germany and Austria, camps like Dachau, Buchenwald and Mauthausen can be found. These camps were immediately after the war accused, in the allied propaganda, of being designed as "extermination camps" with gas chambers. Today it is officially admitted that no one has been gassed. Also on the map, Theresienstadt is marked out. Theresienstadt is a city in former Tjeckoslovakia, where the Germans created an "exemplary"-ghetto for mainly elderly and distinguished Jews. This photograph shows one of the rooms adjacent to the desinfection gas chambers in Auschwitz-Birkenau. 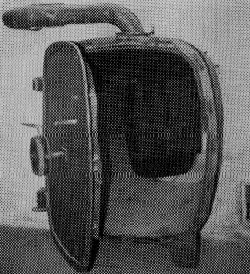 The desinfection gas chambers were used to desinfect clothes with Zyklon-B gas. 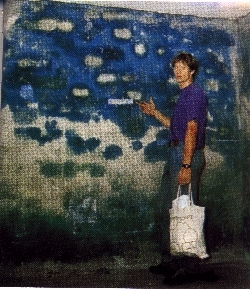 As can be seen, the walls are covered with the characteristic blue colour-pigment, Preussian blue, which is formed when HCN, of which Zyklon-B is made, forms a compound with the iron (Fe) remains in the wall's brick and mortar. The bluish colour of the pigment in the compound is so strong, that it even penetrates the walls of the desinfection chamber, into the adjacent room. This blue pigment is completly lacking on the walls of those rooms that today are alleged to have been homicidal gas chambers, where enormous amounts of Zyklon-B supposedly had been used. 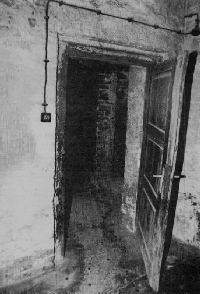 The chemical anlysis, made by the american gas chamber expert Fred Leuchter, of the sampels taken from the inside of the walls of these rooms, clearly show that these rooms never were used for "mass gassings" with HCN-gas. In the "holocaust"-litterature, the claim is often heard, that at Auschwitz-Birkenau, situated on a swamp, hundreds of thousands of corpses were cremated in open air, in gigantic 6 meter deep burning pits. This claim is "supported" by so-called eyewitness accounts from "survivors". The absurdity of the claim is easily exposed when one contemplates the level of the water table in the camp area. The level is so high that it reaches to 60 cm below the ground level. According to what we know, burning something in water is an absolute impossiblity, and the Germans are not known to have been in possession of any such fantastic technique. 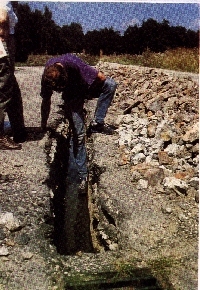 In the photograph the german Revisionist and chemist Germar Rudolf, can be seen, inspecting the water table at Auschwitz-Birkenau. This is a facsimile of a map, taken from the jewish reference book Encyclopaedia Judaica. The map shows the area in southern Russia, from where the Khazars originate and the location of their empire, Khazaria. In 800 A.D., this turkish-mongolic people adopted Judaism as state religion. Note that the Encyclopaedia Judaica even calls the Khazars as "Jews". Today, the descendants of the Khazars make up more than 90% of the Jews in the world. The entire Zionist movement is led by Jews of Khazar origin. Thus it is an incredible fraud when these Khazar-Jews today claim that they are "returning after 2 000 years exile" when they invade and steal the land of the Palestinians.